at Texas State University is providing a 1.5-hour webinar. This webinar will focus for the first half hour on clouds and their role in the Earth’s Energy Budget and implementation ideas using GLOBE for different types of classroom settings as part of Earth Right Now: LaRC 100th digital badge. We will also talk about student badge implementations, extension ideas and extra resources. The second half hour will be very similar but centered on the engineering design process using the Drag Race to Mars Engineering Design Challenge as part of Journey to Mars: LaRC 100th digital badge. The last half hour will then focus on forces and motion and math calculations using paper airplanes and testing different materials as part of Aeronautics: LaRC 100th digital badge. This webinar meets requirements of teacher discussions within the NASA Langley 100th EPDC digital badges. Teachers working on each different badge can join at the specific half hour portion appropriate for them. 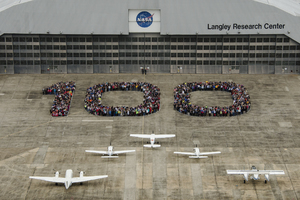 Educators that complete all three Langley 100th Digital Badges will earn a physical badge as part of NASA Langley’s centennial celebration. The three badges, Earth Right Now, Journey to Mars, and Aeronautics are geared to middle school learning standards to make real world connections to the classroom as a way to teach STEM content through the NASA context. Student badges are also available for a limited time. To learn more about the Langley 100th digital badges login to https://nasatxstate-epdc.net/ and search for LaRC 100th. Marilé Colón Robles is the Educator Professional Development Specialist at NASA Langley Research Center and serves the states of Virginia, West Virginia, Kentucky, North Carolina and South Carolina. She creates and teaches professional development workshops for pre-service and in-service teachers as well as informal educators all over the country, delivering these opportunities in both English and Spanish and is part of the Students’ Cloud Observations On-Line (S’COOL) team delivering professional development on clouds and climate. Marilé began her career with NASA in 2010 as an Informal Educator where she curated and developed content for the Hispanic Education Initiative’s bilingual website, organized and hosted teacher professional development workshops, museum events, and STEM summer camps. She has also developed interactive STEM games and taught virtual lessons in Spanish to K-12 classrooms all over the country through NASA’s Digital Learning Network. Prior to joining NASA, Marilé was a graduate research assistant examining interactions between clouds and aerosols and their impact on Earth’s energy balance while earning her graduate degree in Atmospheric Sciences at the University of Illinois at Urbana-Champaign.